Keep your signs within sight, lest your guests run amok! - Harold Tor. As I was strolling around the city today, I found this sign interesting. The panel in the left picture is the back part of it, in the counter-traffic direction. The panel in the right picture is the front part, facing incoming traffic. 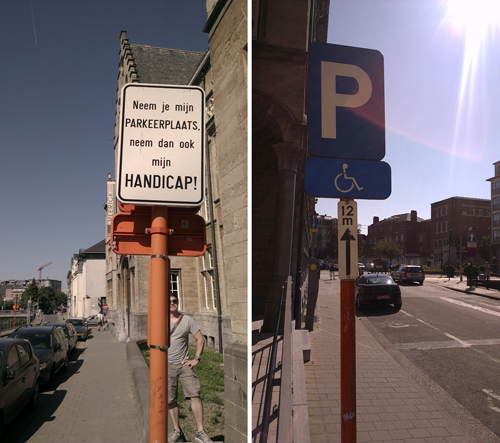 As in accordance to traffic rules, the handicap parking panel is to be placed on the side of the road of the parking lot, just before it and facing the traffic. The lots are also clearly marked with a wheelchair sign. The words on the back panel means “If you take my parking space then take also my disability”. I guess the idea is to make the handicap-parking-taking-offender feel guilty in such a way that if he parks in the lot, he would see this sign in the back mirror or when he steps out of his car. BUT he is does not look up in his back mirror or walks in the other direction he would never have seen this message. Why put up this unnecessary panel at the back? Perhaps because too many people ignore the official sign. But is it useful? Especially when the designer purposely made sure the sizes of the both panels match, regardless of whether the message is big or clear enough to be seen, when it should be facing incoming traffic together with the other panel in order to accentuate the rule. For me, the message panel is unnecessary. It is put up to fit the form, not the purpose. The result is money and effort spent and the goal not reached.